Wanting to find the ideal beach location to have your wedding? Well look no further. 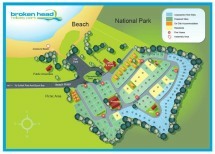 Broken Head Holiday Park has the most gorgeous beaches, perfect to have a wedding. Here at Broken Head our white sandy beaches are secluded so you will have the whole beach to yourself and with beautiful sunsets what better scenery to have as a backdrop. But where to have the reception, you might say… Just 100meters down the road there is the Pavilions. The Pavilions are the best place to host your reception and to accommodate the Bride and Groom. Need accommodation for all the wedding guests, well that’s easy, here at Broken Head Holiday Park we have 5 different styles of cabins and sites to accommodate everyone’s budget type. Why just stay for the wedding, make a holiday out of it. Bring the whole family to make it all the more enjoyable. So book your wedding guests in today on 1800 450 036.